Hi guys. So earlier this month I did a mani with cookies and you all seemed to really love it. I wanted to continue with the food theme, because I frankly love to get my snack on. Sweets always cheer me up and frankly that's exactly what I need these past few days. Without getting into details, my world is being shaken up and I'm going to need lots of prayers and well wishes for my family. Anyway let's get into today's yum-tastic nailart! You're welcome for the chocolate cravings, haha. The charm is available for purchase from Born Pretty Store and it's item #6529. 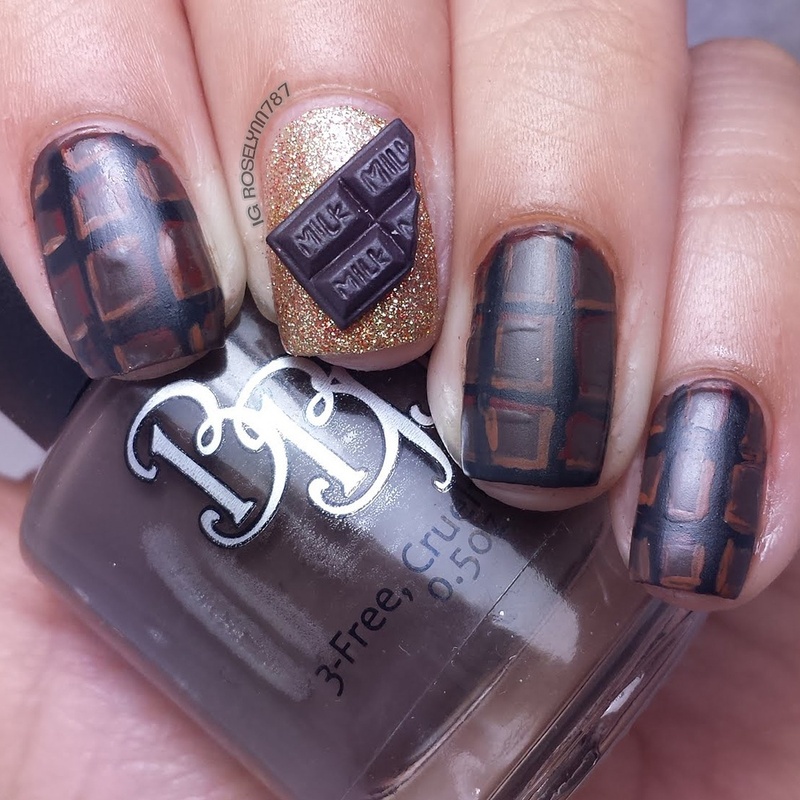 Of course, I couldn't resist the urge to create the chocolate illusion on all my nails so I did some nail art magic. The charm is light-weight and easy to place on your nail as you wish. For short term use, simply stick the charm onto your nail use topcoat. If you plan on using the charm for longer than two days, I suggest using nail glue so you don't lose it. As a huge fan of charms in general, these are right up my alley. I also love the fact that they fit on my shorter nails without being too overwhelming. Initially, I was worried it would be too clunky or entirely too big on my nail but I'm glad that wasn't the case. The best part about this mani is the fact that your lines don't have to be perfect. You can blend them and added the shading with the acrylic paint to hide the imperfections. I uploaded a full length tutorial to my YouTube Channel http://youtube.com/c/RoselynnMercedes787 that you guys can check out if you want chocolate bar inspired nails like this! Here's a direct link to the video: http://youtu.be/79ztZqe_Kyg, let me know what you think! As I mentioned before, the 3D Chocolate Charms can be found in the Born Pretty Store listed as Item #6529. Each pack comes with five charms and is available for $1.85. If you'd like to shop over at Born Pretty Store be sure to use my code ROHG10 to receive 10% off your purchase. As always you'll receive free shipping, however, shipping does take around 3-6 weeks. Are you guys fans of nail charms like this one? Or are you perhaps just a big chocolate fan like me? I have never tried nail charms before, but what a seriously cool idea! I want some chocolate on my nails. Oh how cute is that! My nails aren't long enough for charms but u would love to do this! It's so cute! Well, that's the cutest thing ever. It's perfect for me, too. I love my chocolate! Great nails! I love these nails. They look so cute, and they're a great way to show off our love for chocolate! I love you chocolate! You always pull off the charms so well! This Looks delicious! Um, Those are some stylin' nails. You have nail art skills, love the chocolate on them haha!! What delicious looking nails! I've never seen chocolate charms before. They look good on you. These are flippin awesome! Haha like I don't know what else to say except I probably would have tried to eat/lick my fingers. Haha! I have similar charms from Born Pretty Store that I have been planning on using. These are great! this is freaking adorable! I'm kind of obsessed. Your nails look great! I've never seen charms like that before! Who doesn't love chocolate? Oh gosh I think I would want to bite my nails when they have those chocolate charms. They look too good and I'm sure they will be conversation starters. Super cute! I love the food theme. How cute is that! And yes I am now craving chocolate. This is such a cool and creative way to do your nails! Love the chocolate theme! These are so cute! I'm not sure I wouldn't be tempted to eat them though, haha. OMG! I really like it looks my nails are so yummy and sweet lol. How cute! But do the nail charms get int the way or do they feel natural? I love how you incorporated the bars on your painted nails! Nice job. I love nail charms and I love chocolate. This is so cute and I love the warm color of your polish, really pretty. 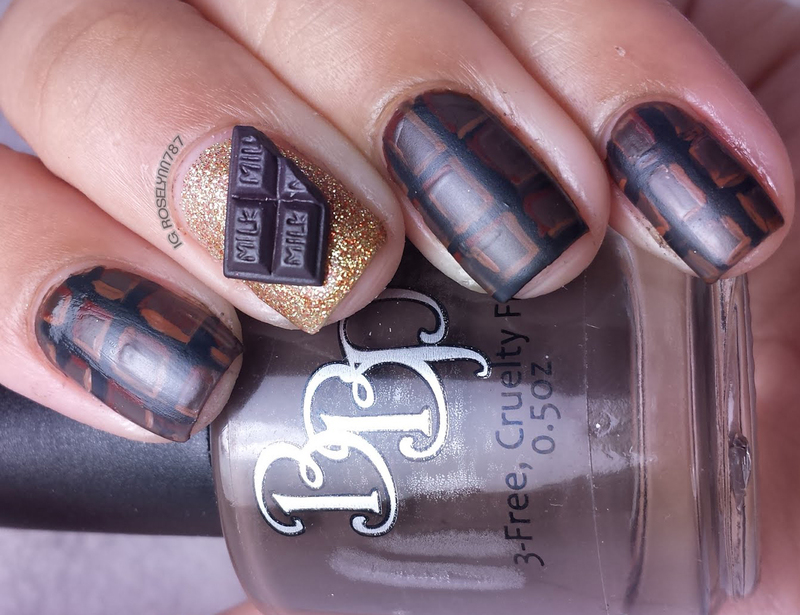 I think if I had that charm on my nails I'd be craving chocolate every time I looked at them! It's very cool though. The charm is awesome but it's your hand painted chocolate that's really blown me away! Born Pretty Store sells such crazy, fun things! Your manicure looks really good. I wish your family well, I hope everything will turn out fine :) . Haha makes me want to bite those nails lol., Kidding aside I think that's so creative especially for chocolate lovers. Looks so tempting. Such cool design. I really wanna have that Chocolate 3d charm now. Those are so cool! And I love chocolate anyway! How super cool and creative. I love it. You're making me hungry :D! That is such a neat and creative idea. I would never be able to do something like that. That is so cool and hip! I have never had nail charms, of course they would last on my nails they are taken through the dirt and everything on a daily basis. But I enjoy looking at them on others! This may be my favorite manicure so far! This charm is too stinking cute! These nails turned out fantastic. I love chocolate so these would be perfect for me. These nail charms are so cute! I love how different they are and they look great! I'm going to have to check this out! This is such a cute nail charm. My daughter and i would love this on our nails. It is such a cute idea. This is super cute! I love the art you did to match, it is perfect! That soooo cute! I love all the nail art they have these days. And that looks great with the design you created. Thanks for sharing. Yum yum yum!!! Delicious looking nails, I love them! Whoa that is totally impressive! Those nails look good enough to eat. What fun!